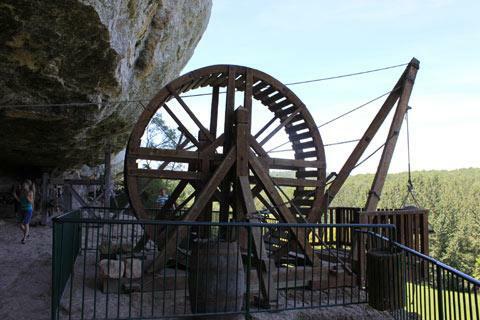 The cave system at La Roque-Saint-Christophe is a large prehistoric settlement complex situated about nine kilometres north of Les Eyzies, on the south bank of the Vezere River, in a very scenic and attractive location. La Roque-St-Christophe is the largest settlement of its type in Europe. Note: the scenery in the wooded Vezere valley is almost as much a highlight here as the ancient settlements! 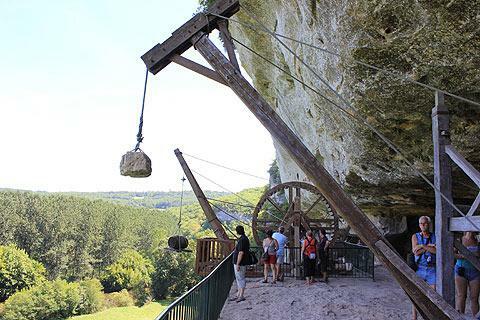 La Roque-Saint-Christophe is an extensive series of caves that have been carved out of a soft limestone cliff, initially by the action of the river then with further excavations by prehistoric man. It was from the 6th - 16th centuries that the cliff also became developed as a village, with numerous buildings and fortifications backing onto the cliff. It seems likely that the village was occupied continuously during this entire period, until it was finally abandoned in 1588 during the Wars of Religion. By the middle ages the 'town' included all the commerces that you would expect to find such as shops, areas for raising animals, a forge and a bread oven. Although we can see remains of these it is not easy to imagine this peaceful riverside location at La Roque-Saint-Christophe as a thriving town! The cliff village at La Roque-Saint-Christophe is just one of several prehistoric settlements in this region: discover the other main sites in our Vézère valley guide.